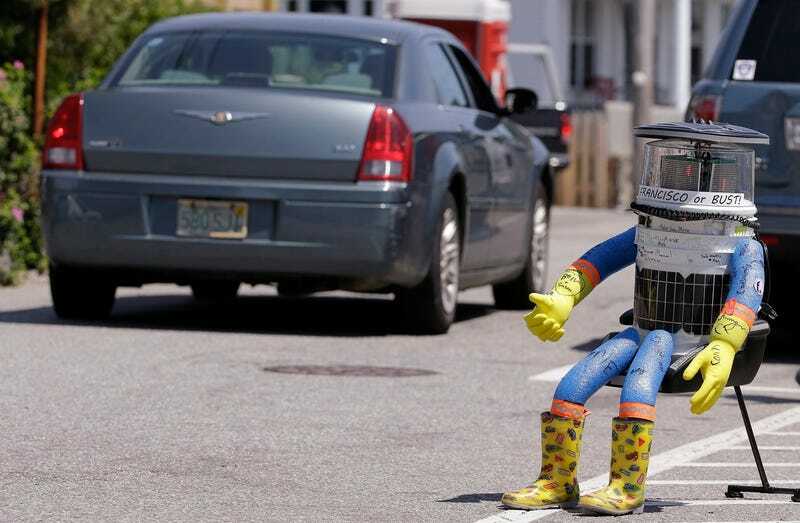 When hitchBOT the hitchhiking robot started his journey in Boston two weeks ago he wanted to see the entire country. Unfortunately, he never made it out of the Northeast. The researchers who built hitchBOT announced today that they need to stop the experiment because hitchBOT was vandalized in Philadelphia. The goal of the hitchhiking trip was to see how humans would interact with hitchBOT. And apparently the answer was “not well.” HitchBOT has been around the world, including trips across the entirety of Canada and Germany without major incident. But America is clearly a hard land for our robot brothers and sisters. Update, August 2nd: Canadian journalist Lauren O’Neil has posted this photo of hitchBOT, which appears to show how he was found in Philly. His head is missing and his arms were ripped off. It’s unclear whether the Canadian researchers who built hitchBOT have plans to repair him and put him back out on the road. According to their website, they’ll be giving interviews starting tomorrow, so hopefully we’ll learn more then. In the meantime, America should sit in the corner and think about what it’s done to poor hitchBOT. Update, August 2nd: The people thought to have last seen hitchBOT in one piece on Friday were video bloggers from BFvsGF. You can fast forward to 7:30 in the video to see where they pick up hitchBOT in Philly. If you know who may have harmed hitchBOT please email: novak@gizmodo.com. Update, August 3rd: Video has surfaced of the jerk who killed HitchBOT. Update, August 4th: Now that the full “surveillance video” has been released, it’s clearly a fake. But it’s still unclear whether Bassmaster and Wellens destroyed hitchBOT.